Pictured, from left, are representatives of UA’s national championship moot court team Josh Kravec, Anne Miles Golson, Cory Church, Lindsey Barber and Mary Ksobiech, assistant dean for students. TUSCALOOSA, Ala. — A University of Alabama Hugh F. Culverhouse Jr. School of Law moot court team recently won a national competition in New York, defeating more than 150 other teams and landing UA its first championship in the event’s history. 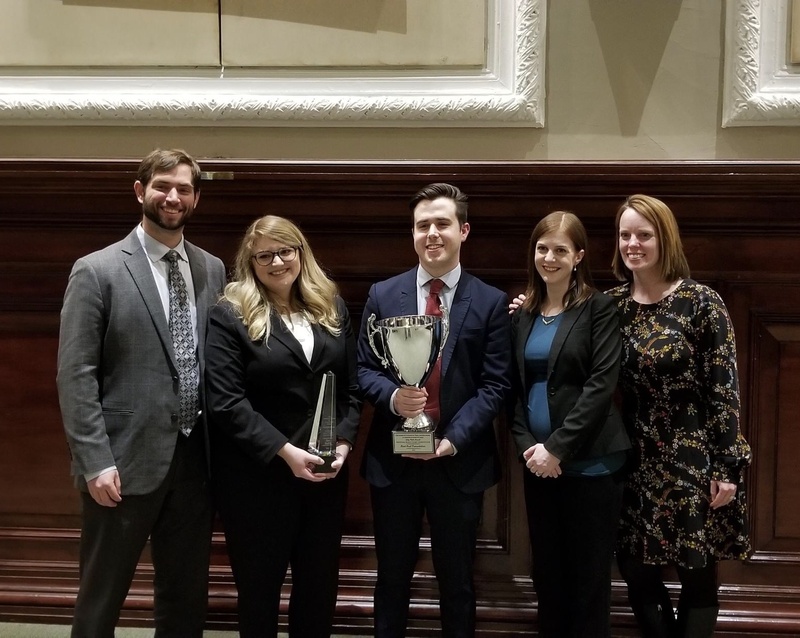 The team won preliminary rounds of the 69th Annual National Moot Court Competition and then defeated William & Mary, South Texas College of Law, Iowa and the defending national champions Northwestern, completing an undefeated run. Team members include Lindsey Barber, of Buffalo, New York; Cory Church, of Greensboro, North Carolina; and Anne Miles Golson, of Montgomery. The team is coached by Mary Ksobiech, assistant dean of students, and managed by Josh Kravec, a second-year law student. In the final round, before a panel of six federal and state appellate court judges, Judge Richard C. Wesley described it as having advocacy better than he had heard in his hearings that day. Of the 28 teams who qualified for the finals, the UA team was the only one comprised solely of second-year law students. The Moot Court Fellows program was started in 2011 to train a team of second-year law students in moot court to improve their success rates in their third year. This is the second time in the last four years that the Alabama Moot Court Fellows team has advanced past regionals to the national tournament. Golson was named the Best Advocate for the tournament. This summer, Barber will work for Baker Donelson and Waller Lansden in Birmingham, Church will work at Bradley Arant and McGuire Woods in Charlotte, North Carolina and Golson will split her summer between Bradley Arant in Birmingham and Jones Day in Washington, D.C.